Loud music, few inhibitions, close, sweaty contact with others, the sensual movement of body on body… it's not surprising to think that this situation could end with a one night stand. What may be unexpected is that one night stand turning into a night of self discovery and an exploration of relationships and what makes men and women tick. 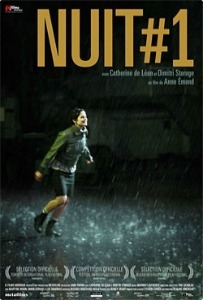 Anne Émond's debut feature Nuit #1 begins at a rave. Clara and Nikolai meet while sharing a night of dancing which ends at Nikolai's apartment in a tangled mess of bodies and sheets but when Nikolai catches Clara sneaking away without so much as a goodbye, he launches into a critique of modern women who behave like men. This claim leads to hours of conversation where "Clara and Nikolai learn as much about each other in a few hours as some learn over the course of a long-term relationship." Set mostly in Nikolai's apartment, Nuit #1 delves into the deepest corners of both parties to reveal not only what makes these characters tick but what their condensed relationship has to say about the way we interact. I love one room dramas. Add in a tale that pointedly deals with a topics as complicated as relationships and love you have me hooked. A beautiful trailer doesn't hurt either.